At the end of the year in 2004, I had two of the biggest pulls of my collecting career. 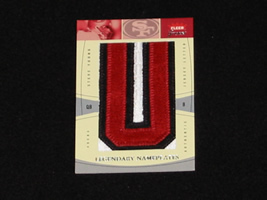 While opening a box of 2004 Fleer Greats of the Game Football I pulled a Steve Young Letterman “U” Game-Used Patch #’ed/5. 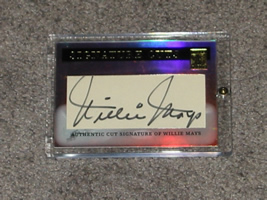 A few days later I tried a pack of 2004 Topps Tribute Cut Signature Edition and pulled a Willie Mays Cut Signature #’ed 1/1. That Mays autograph got me into an issue of Beckett. At that time collectors still read the magazine, and I sent them an e-mail letting them know what I pulled. Within that issue of Beckett, I saw the first preview of 2005 Donruss Timeless Treasures. For the most part, 2005 Donruss Timeless Treasures is your run of the mill product. Inside each tin you’ll find (1) pack with a “hit” numbered to 100 or less. You also get (2) base cards and (1) insert. Its not really known for rookies, but there are a few in here. Justin Verlander is probably the most notable rookie you could pull. Since the time this product was released, many of the other rookies have burned out. Current stars of the day, and retired/HOFers is what you’ll find. From a design standpoint, its alright. There are a ton of foil sticker autographs. 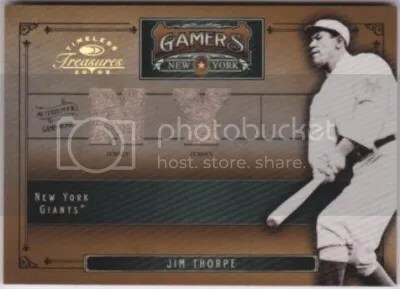 The unique thing about 2005 Donruss Timeless Treasures is that it includes the first Jim Thorpe baseball relic cards. At least that’s what we thought. Although he is known mostly for football, Jim Thorpe played professional baseball from 1913 to 1919. We had seen Jim Thorpe football relics for years, but never baseball. As you can imagine, these cards were hot items when they came out. Unfortunately, every single Jim Thorpe baseball relic card made starting with this product doesn’t have a happy ending. None of them are authentic despite what the back of the card says. The jersey was eventually determined never to have been used by Jim Thorpe at all. You would think that Panini would address this issue head on with collectors, but that’s never happened. Panini just sweeps it under the rug as if everything is fine. People wanting to add these cards to their collection continue to spend hundreds of dollars on them because they think they’re real. THEY AREN’T!!! Even though Donruss/Playoff was the purchaser of the jersey, Panini still used it to make cards after they bought them. Ignoring the issue is what makes me mad the most.